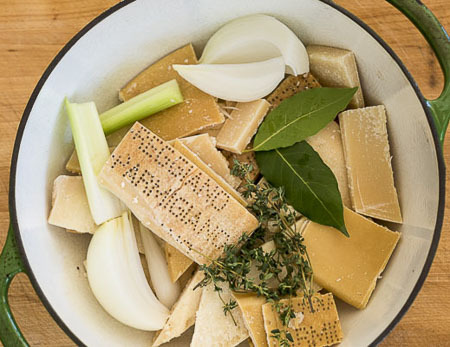 It’s never too late to start collecting Parmigiano-Reggiano rinds in the freezer. Ask your favorite cheese merchant to save them for you. I have to warn you: Any cheese remaining on the rinds will get soft and spongy during cooking, and some of that gooey cheese will cling to your pot. The cleanup is a pain but worth it. Use this stock for vegetable soups or risotto. Recipe courtesy of Napa Valley caterer Sarah Scott. Let the stock cool, then strain. Refrigerate the stock overnight, then lift off the congealed fat. Use the stock within a couple of days or freeze for longer storage.